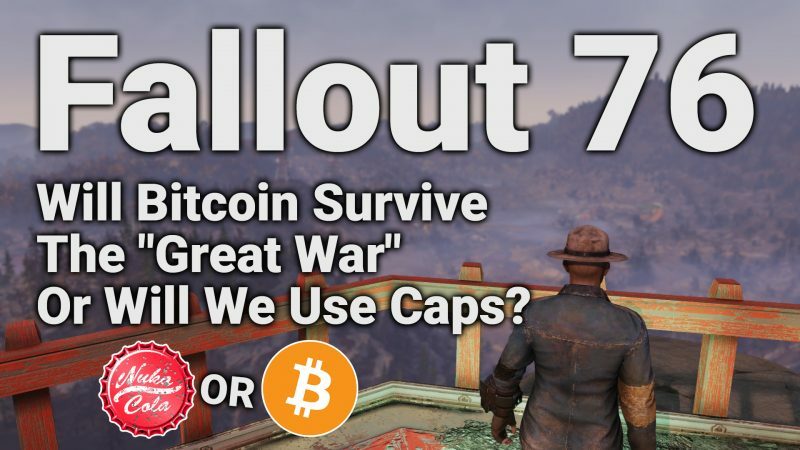 Fallout 76 Review: Will Bitcoin Survive The “Great War” Or Will We Use Caps? I have always been a fan of the Fallout series since day one. It was one of my favorite computer games to play when I was younger and the apocalyptic theme always stuck a particular chord with me personally. Fallout 76 is the brand new multiplayer online version of the series that just launched on November 14th, or officially "Reclamation Day" as it's called around the Vault. In the game you no longer use what is called "Pre-War Money" now in the game, but the currency is "caps". Like bottle caps from beer or perhaps your favorite flavor of Nuka-Cola. 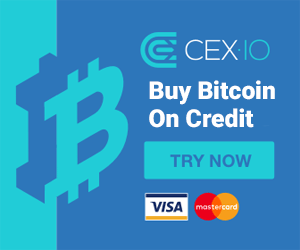 This got me thinking... could Bitcoin survive a "Great War" where nuclear fallout persisted for half a century or more? Keep reading for my review and if I think we will all be using caps in the apocalyptic future. The latest in the much beloved series takes things online in a somewhat mass multiplayer version of the Fallout world where you are a vault dweller of Vault 76 based in West Virginia. 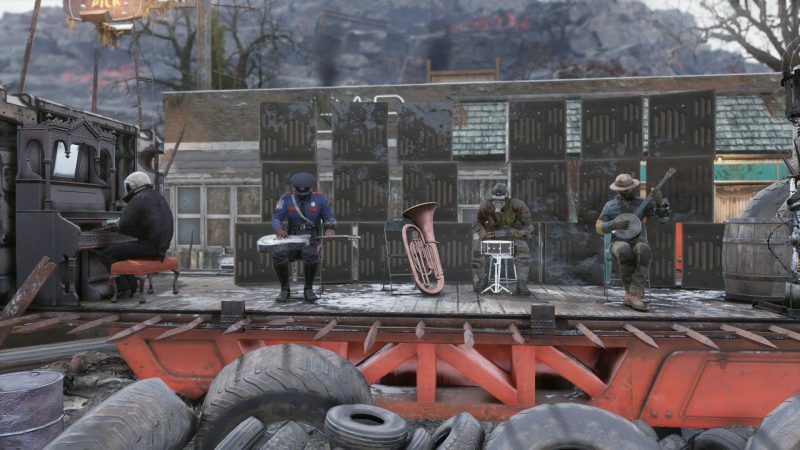 FUN FACT: The Mayor of West Virginia official declared November 14th, 2018 as Reclamation Day in the state in a partnership with the game. 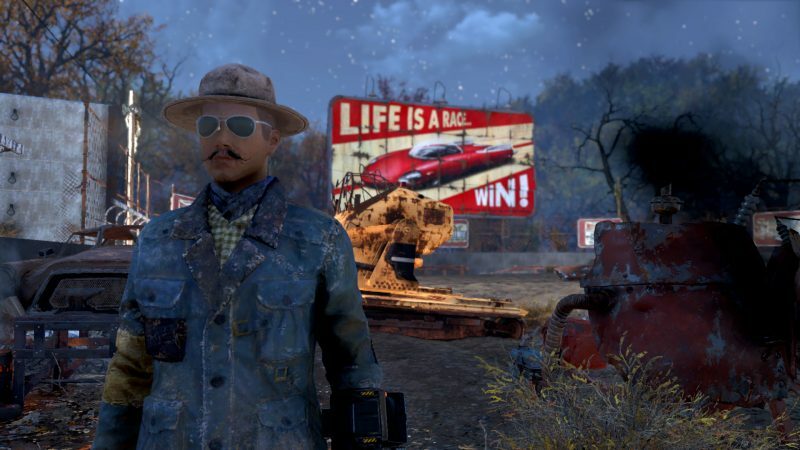 You start the game by creating a character in the creator (which you could easily spend hours in) and then you wake up in your vault barracks on Reclamation Day (the day everyone gets to leave the vault) and are now ready to head out into the wastelands of Appalachia. 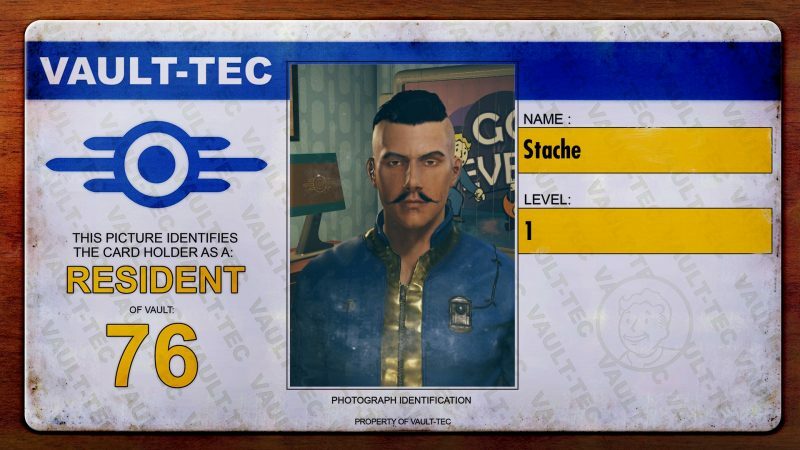 Here is the 'Stache on Reclamation Day! The first impression is great, and it has all the classic elements of a Fallout game (which always start in the vault). If you played Fallout 4, you will be very familiar with the look and feel of the game. The first thing you notice as you start to explore is there are no NPC's really. Robots & computer terminals combined with holotape audio records provide the story and questing. At first, I didn't like the idea of no real NPC's, just your fellow Vault dwellers (which are limited to 24 players per server), but after playing a while I actually really like how desolate it makes things feel. The same thing goes for the player limit on the server. While Fallout has classically been a single player game, the limit of 24 players on the server is effective in creating that same feeling of a single player game with some random encounters with other players. I easily played for hours and hours without ever encountering another player on a full server. 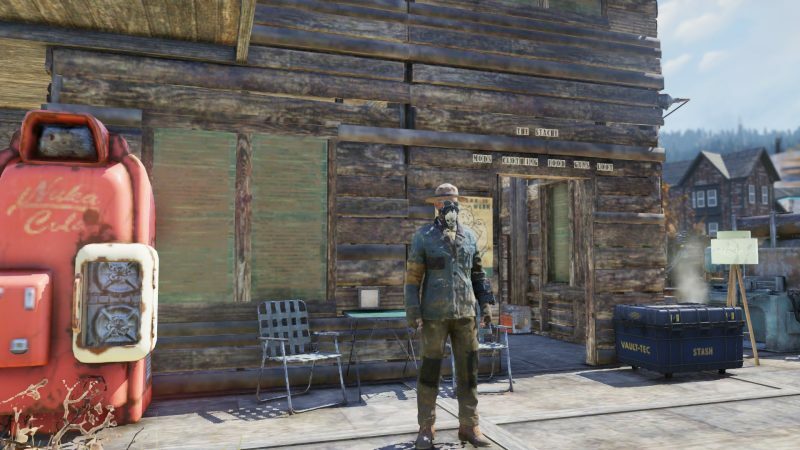 It wasn't until I built my C.A.M.P. by the train station that I started seeing other players regularly and trading with them too! Funny Normie Use Bitcoin, Caps Only Meat Bag! As I said before, the game uses "caps" or bottle caps as the in game currency and Robots, as well as some traveling Super Mutant merchants, will trade you weapons, armor, & chems for your caps. Many computer terminals exist in the game and provide lots of quests and access to rooms and special areas & are an integral part of the Fallout 76 every day lifestyle. Could Bitcoin still survive in a day and age like this? If Fallout 76 shows us anything it's that Robots and electronic things have a much easier time dealing with nuclear fallout than humans do! When it comes to currency, humans have used many different forms over time, so is it really so ridiculous to think that we could use a system of bottle caps in a dystopian apocalyptic future? I don't think so, and I think that is the same reason why Bitcoin can easily succeed as a global currency. Humans can abstract value to just about anything we want, as time and condition change we adapt and continue to survive. Of course Fallout 76 is just a game, but it does make you think about such things in a different context. While Fallout 76 certainly has a few things I don't like, just like any online mmo does, overall I think it is a fun and very Fallout like game. Many online reviews I read bash the multiplayer aspect as Fallout has classically been a single player game, but I think it really does work they way they set it up. I know that I am going to be playing this game and I have had a ton of fun so far with some epic quests, crazy monsters, and catching the very first Nuclear bomb drop in the game live with a bunch of other players. Now that is something you couldn't do in a Fallout before, and I think the decision to make an MMO version of Fallout was an atomic idea!